Edward Schumacher-Matos comes to the Murrow Center with a unique background. He has been a prize-winning journalist at some of the nation’s most prestigious news outlets, an academic at top universities, and a media entrepreneur. Through his experience in digital media, international reporting, cross-cultural communication and migration research, Prof. Schumacher-Matos brings a deep understanding of today’s networked world. Since taking over in the fall of 2015, he has re-cast the center with cutting edge projects, teaching and research that follow in the forward-thinking tradition and integrity of Edward R. Murrow himself. Prof. Schumacher-Matos began his media career while a student at Fletcher, working nights on the foreign desk at The Boston Globe and as a reporter at the Quincy Patriot Ledger, covering Boston’s South Shore. He moved to Japan, where he was a prolific stringer for The Washington Post there and back in New England. He then joined The Philadelphia Inquirer, where he was part of a team to win a Pulitzer Prize covering the Three Mile Island nuclear accident. Prof. Schumacher-Matos moved to The New York Times, where he was the NYC economic develop reporter and bureau chief in Buenos Aires and Madrid. After two years as director of the Spanish Institute in New York, he joined The Wall Street Journal, where he became founding editor and associate publisher of The Wall Street Journal Americas. Professor Schumacher-Matos left to start his own chain of four Spanish-language dailies in Houston, Austin, San Antonio and the Rio Grande Valley, with backing from Pearson. His record of journalistic excellence and ethics led him to being selected as ombudsman at NPR, his most recent news job. As an academic, meanwhile, Prof. Schumacher-Matos has been the Robert F. Kennedy Visiting Professor in Latin American Studies at Harvard’s Kennedy School of Government, where for three years he taught on immigration policy. At Harvard, he also was a Shorenstein Fellow on the Press, Politics and Public Policy and founder and director of the Migration and Integration Studies Program. He became the James Madison Visiting Professor on First Amendment Issues at Columbia University Graduate School of Journalism, where he taught digital strategy and courses on reporting and international news analysis, before returning to Fletcher. Reflecting his specialty on mass migration, Professor Schumacher-Matos is currently a Global Fellow at the Woodrow Wilson Center for International Scholars, as well as a fellow at the Migration Policy Institute in Washington and the Global Migration Center at the Graduate Institute for International and Development Studies in Geneva. He has been a Fulbright Fellow in Japan and a Bi-National Commission Fellow in Spain. Prof. Schumacher-Matos has served on a number of boards. He is a member of the International Advisory Board of IE University Graduate School of Business in Madrid and of the Latin America Program at the Woodrow Wilson Center in Washington. He was formerly a board member of the Inter American Press Association, the International Ombudsman Association and the Tomas Rivera Policy Institute at the University of Southern California. He is active in the Council on Foreign Relations and in the Americas Society/Council of the Americas. 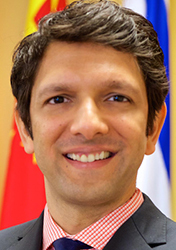 Mihir Mankad is the Deputy Director of The Murrow Center and a Lecturer in Communications at The Fletcher School, Tufts University, and currently leads communication and media initiatives at the school. His course, The Arts of Communication, has become one of the highest enrolled courses at the school, with over 350 course enrollees in just 3 years. Mihir’s career spans a diverse array of fields, including media, management consulting, and nonprofit leadership. Previously, Mihir served as a national television anchor with top channels in India such as NDTV Business, Zee Sports, and the public broadcaster Doordarshan. In addition to hosting prime-time news bulletins, he was involved in anchoring three of the most viewed television events in Indian history, including the 2008 Olympics, 2010 Delhi Commonwealth Games, and the 2011 Cricket World Cup. Mihir’s pre-television career includes management stints at McKinsey, Bain, and The Clinton Foundation, where he was in charge of the country operations of the health access initiative. Mihir holds a Bachelor’s degree in Economics and Psychology from Stanford University, where he was on the national championship tennis team, an MBA from the Kellogg School of Management, and a mid-career MPA as a Mason Fellow from the Harvard Kennedy School of Government. Michael W. Klein is the William L. Clayton Professor of International Economic Affairs. He served as the Chief Economist in the Office of International Affairs of the United States Department of the Treasury from 2010-2011. He is a Research Associate of the National Bureau of Economic Research, a Non-Resident Senior Fellow of the Brookings Institution, and an Associate editor of the Journal of International Economics. He has been a visiting scholar at the International Monetary Fund, the Board of Governors of the Federal Reserve, the Federal Reserve Bank of Boston, the Federal Reserve Bank of New York, and the Federal Reserve Bank of San Francisco. His research and teaching focus on international macroeconomics. He has published three books and over two dozen articles on topics such as exchange rate policy, international capital flows, the impact of trade on the U.S. labor market, and the determinants of foreign direct investment. His most recent economics book is Exchange Rate Regimes in the Modern Era, published by MIT Press. His research has been supported by grants from the Up john Institute for Employment Research and the Bill and Melinda Gates Foundation. He received a PhD in economics from Columbia University and a B.A. from Brandeis University.